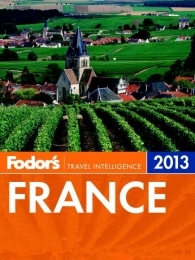 My recommendation when traveling to France is Fodor’s France 2013. Fodor’s is usually my go to publisher for travel books. This particular guide offers great maps, photos and amazing descriptions. It also includes recommendations on hotels and restaurants (make sure to check online before you go to verify that they are still open, as there might be a gap between when they published the book and the time you are going).